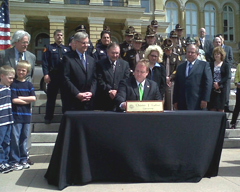 Governor Culver signs the texting ban into law. It will soon be against the law to “text” while you’re driving in Iowa, although if you’re caught texting behind the wheel you’ll just get a warning in the next 15 months. The $30 fine for ticketed texters goes into effect July 1, 2011. Iowa Public Safety Commissioner Eugene Meyer says the state will launch a public relations campaign to educate drivers. Meyers and his staff plan to will work with the media and cell phone companies on a campaign to change drivers’ attitudes. “It can wait. Drive to your destination and then make your phone call or send your text message,” Meyer says. The new law is tougher on teenagers as the under-18 crowd will be barred from even using any handheld device while they’re driving. That means no texting and no cell phone calls either. “Any piece of legislation that makes the road safer for people traveling on our roads and highways is a very important piece of public safety legislation and should be celebrated by all Iowans,” Meyer says. Public Safety Commissioner Gene Meyer speaks at bill signing. 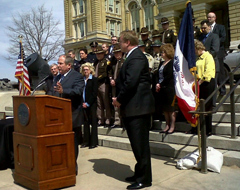 Meyer spoke early this afternoon at a bill signing ceremony staged on the steps of the Iowa statehouse. State Troopers, central Iowa police officers, the head of the Iowa D.O.T. and some key lawmakers looked on as Culver signed the text ban into law. “Because over the last four to five years we’ve been talking about distracted drivers and this is the first significant piece of legislation that we’ve accomplished that addresses that specific issue,” Tjepkes says. Iowa Department of Public Safety staff passed out mugs that read: “Don’t drive intexicated” to those who attended today’s bill signing ceremony.